After Heroes of Might and Magic II‘s unprecedented operatic splendour, the composing team of Paul Romero, Rob King and Steve Baca faced a problem when they tackled the franchise‘s next soundtrack: where to go from here? Heroes of Might and Magic II found its approach by amplifying its predecessor’s ambitions and scale. As a result, it rocketed past other Western game soundtracks at the time into uncharted territory. Repeating the same strategy – going grander – for the Heroes of Might and Magic III soundtrack wasn’t an option. After all, how much bigger can you go than full-blown operatic grandeur? What was Romero, King and Baca’s answer to this dilemma then? 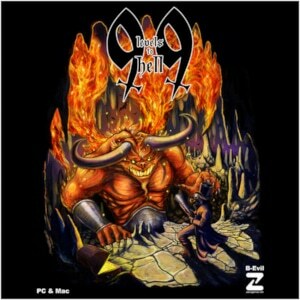 In a nutshell, they play it safe on the Heroes of Might and Magic III soundtrack. This is not an envelope-pushing work like its two predecessors. 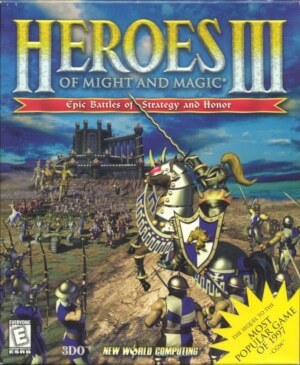 Instead, Heroes of Might and Magic III is nothing more and nothing less than a really great fantasy score, with all the stylistic trappings one would expect from the genre. It’s a less dazzling, extrovert work than Heroes of Might and Magic II. However, its melodic beauty and orchestrational finesse still tower above the vast majority of fantasy scores. This elevated position is largely due to the same strengths that already characterised Heroes of Might and Magic II. Orchestral textures are lush and lovingly shaped, with an acute ear for effective counterpoint. Cues develop marvellously well and pack stunning amounts of diversity into two minutes of running time. And above all, the score’s greatest strength is its ever reliable, never ending flow of beautiful melodies. It’s all these qualities that make Heroes of Might and Magic III‘s adherence to genre stereotypes entirely forgivable. At every turn, it fills the fantasy formula with life and excitement. It helps that the music’s textures feel a bit less crammed than on Heroes of Might and Magic II. Romero tempers the youthful exuberance that saw him tossing as many ideas as possible into the castle themes on Heroes of Might and Magic II. This time around, he sounds more relaxed. Equally, he’s keenly aware of how to create elaborate compositions that give their ideas and melodies enough room to breathe. Romero also returns to a methodology he used on Heroes of Might and Magic. Once again, he structures his castle themes as variations of a motif or melody. This helps to further smoothen out the compositions’ flow. Despite its less dramatic air, this soundtrack doesn’t give up the sense of scale and emotional diversity that Heroes of Might and Magic II had accomplished. On the Heroes of Might and Magic III soundtrack, Romero, King and Baca once more manage to seamlessly mix a wealth of disparate atmospheres and colours into coherent compositions. This trait is particularly obvious on the album’s darker tracks. These pieces, despite all their Gothic demeanour, have an underlying playfulness that ties them in with the soundtrack’s bright mood. Even the gloomy depths of “Town – Dungeon” remain quite light-hearted with their traipsing string and brass rhythms, and a moody oboe melody on top. Similarly, “Town – Inferno” does a tremendous job at balancing the blithe sounds of a music box and a bouncy woodwind melody with the requisite ominous string tremoli and commanding brass. This absorbing melange of moods is evident on many of the less sombre compositions as well. “Town – Fortress”‘s charming opening escalates unexpectedly into a grandiose episode. Full of building horn chords and driving violin and woodwind figures, the piece reaches its climax through a soaring motif. “Town – Tower”, the soundtrack’s longest composition, is even better. In fact, it’s the entire franchise’s best developed composition, and the apogee of the variation form Romero deploys. Taking elegant triple meter rhythms as its basis, “Town – Tower” moves through a ravishing wealth of melodies, moods and textures. Where the Heroes of Might and Magic III soundtrack manages to surpass its brilliant predecessor is with its terrain tracks. These are now more similar in style to the castle themes – lavish and full-bodied rather than sparse and introvert. This makes for a more seamless, if also less surprising album flow. Once more, the compositions’ melodies and textures never cease to amaze. “Terrain – Underground” and “Terrain – Water” are impressionistic tone idylls, completely enrapturing and addictive in their sheer beauty and lushness. “Terrain – Swamp” features a cheeky, tumbling bassoon figure that remains charmingly unfazed by the oppressive, humid string atmosphere around it. Similarly, “Terrain – Rough”‘s flute melody has an intensely yearning, aching character that highlights how much more melodic the terrain tracks are this time around, more clearly defined and less drifting – if at the same time also more indebted to fantasy scoring conventions. Ultimately, what listeners are left with is the perfect starting point for any score fan new to this venerable franchise, and a must-have for every fan of gorgeously orchestrated game music.